The callous disregard of tribal sovereignty in the planning of a Dakota Access Pipeline route took a long time to receive attention by main stream media. Even though the route poses a grave threat to the water supply of the Standing Rock reservation, in the end, with a stroke of the mightiest pen in the land, US president Trump made it a reality. Clean water is essential for human survival, mni wiconi – water is life, but, as the decision made clear, in a free market system driven by unfettered capitalism, water is simply viewed as a commodity whose quality can be sacrificed for the pursuit of profits. There was an outcry at first, but soon other events caught the eye of the media and the issue faded from public view. There are many instances of actual and potential water contamination from pipelines in the indigenous borderlands of the US and Canada, such as the intensified use of the aging and hairline cracked Line 5 pipeline under the Straits of Mackinaw to move tar sand sludge from Canada across the border into Michigan. Should the pipeline rupture, it would despoil the largest freshwater reservoir in the world. Yet, one is hard-pressed to find any news reports about this and other pipeline developments in the vicinity of native nations. 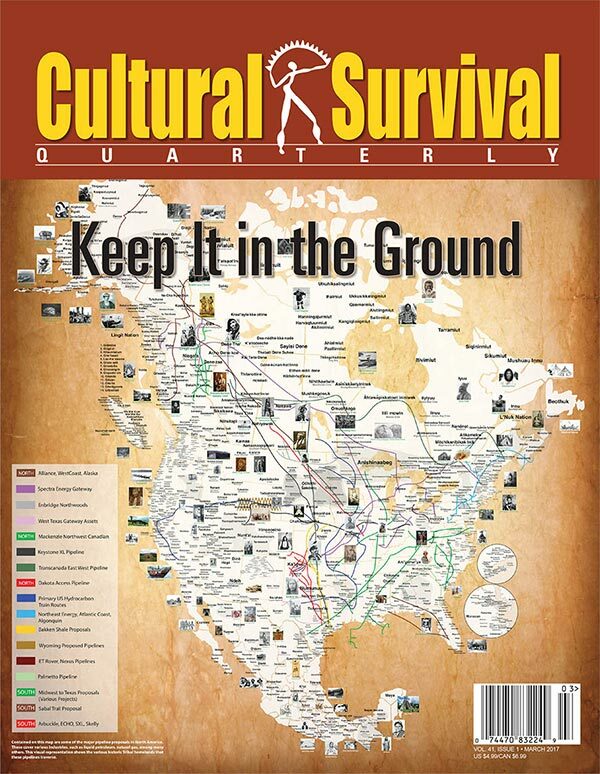 Cultural Survival Quarterly Magazine published an issue in March 2017 devoted to the impact of extractive industries on indigenous populations. The cover features a map by Aaron Carapella that depicts pipeline projects in tribal homelands in North America.